Sydney, Aug 6, 2012 AEST (ABN Newswire) - Dynasty Metals Australia Limited ( ASX:DMA) refers to its previous announcement on 29 May 2012 in relation to its minority interest of 8.65% in a joint venture company with a subsidiary of Tiaro Coal Limited ( ASX:TCM) ('Tiaro Coal'). Dynasty Metals has today entered into an agreement with Tiaro Coal to transfer its minority interest in the joint venture company to Tiaro Coal in exchange for 3,000,000 ordinary shares in Tiaro Coal. The TCM shares will be escrowed for 12 months. 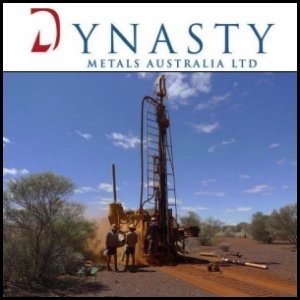 Dynasty Metals' Managing Director, Lewis Tay said, "This transaction is in line with Dynasty Metals' focus of utilising its capital for the ongoing development of its iron ore projects. By converting the JV interest in T956 and T957 into TCM shares, it avoids Dynasty's interest in these tenements being further diluted, yet allowing Dynasty to participate in the overall upside of the TCM coal projects and with greater liquidity on that investment".